The new and improved Phillies began the Bryce Harper era with three big home runs and a 10-4 opening day victory over the Atlanta Braves on Thursday. 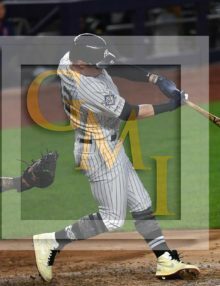 The sellout crowd of 44,469 was electric and it had a lot to cheer about, starting with a leadoff home run by newcomer Andrew McCutchen in the first inning and ending with a grand slam by Rhys Hoskins in the seventh. In between, Maikel Franco belted a three-run homer and Odubel Herrera and Cesar Hernandez had two-out RBI hits in the fourth. There were first-inning fireworks at Citizens Bank Park, even though the storybook scenario of Bryce Harper doing damage in his first plate appearance didn’t come to fruition. New Phillie Andrew McCutchen, leading off, hit a solo home run on a 2-0 count that caused a roar not heard at Citizens Bank Park in years. It provided Aaron Nola his first run of support of the season following Nola’s 1-2-3 top of the first. It was McCutchen’s 13th career leadoff home run. Last season, he hit .350 with four homers and two doubles as the first batter of the game. 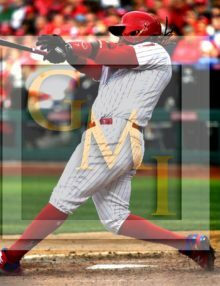 Harper went hitless in his first game with the Phils, but was on base for Hoskins’ grand slam after drawing an intentional walk. Unfortunately, HARPER went 0-3 on the game with that walk. 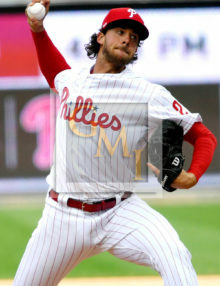 Phillies Ace, AARON NOLA, pitched a great game, allowing only one run, and two hits, with 8 strike outs over 6 innings. 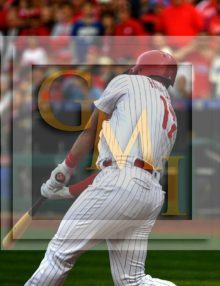 The two hitting stars of the game were MAIKEL FRANCO, who hit a three-run home run in the 6th inning; and RHYS HOSKINS, who hit his first grand slam home run of his career in the 7th inning. The Phillies are off to a great start and a team that will likely make the playoffs. 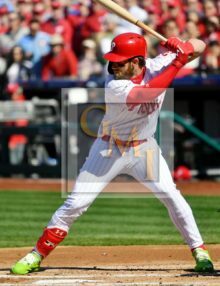 Check out all of the other images from today’s Philadelphia Phillies home opener against the Atlanta Braves won by the Phillies 10-4. The two images of BRYCE HARPER were pretty special, who was welcomed by Phillies’ manager, GABE KAPLER, by the team, and by the fans. 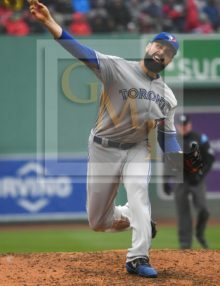 Unfortunately, HARPER went 0-3 with a walk. Philadelphia Phillies BRYCE HARPER awaits his first pitch in a Phillies uniform from Atlanta Braves starting pitcher Julio Teheran. Despite the fact that HARPER went 0-3 along with a walk, the Phillies defeated the Braves 10-3 in the Phillies home opener. Philadelphia Phillies starting pitcher, AARON NOLA, throws his 98th and final pitch in the sixth inning against Nick Markakis who popped out to end the inning. 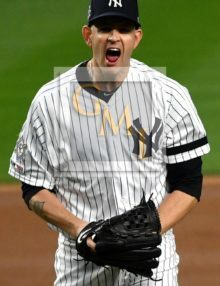 NOLA allowed only 2 hits and one run striking out 8 leading the Phillies to a 10-4 opening day victory over the Braves. 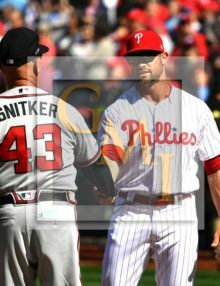 Philadelphia Phillies manager, Gabe Kapler, shakes hands with Atlanta Braves manager Brian Snitker prior the Phillies home opener. 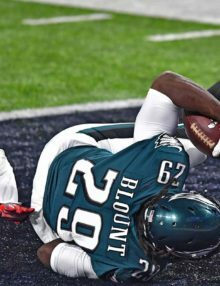 The Phillies went on to win 10-4. Philadelphia Phillies third baseman, MAIKEL FRANCO, hits a three-run home run in the sixth inning off of Atlanta Braves reliever Shane Carle. The Phlllies went on to win their home opener 10-4. 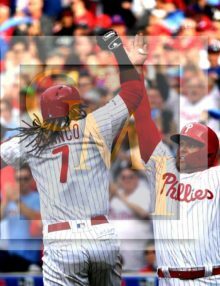 Philadelphia Phillies third baseman, Maikel Franco, celebrates hitting a three-run home run in the sixth inning off of Braves relief pitcher Shane Carle The Phillies went on to win 10-4. 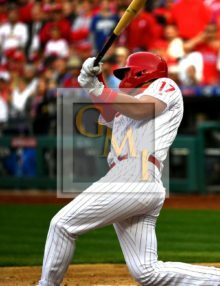 Philadelphia Phillies first baseman, Rhys Hoskins hits his first grand slam home run off of Atlanta’s relief pitcher Luke Jackson. 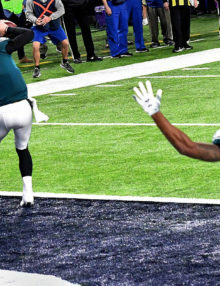 The Philliles went on to win 10-4.